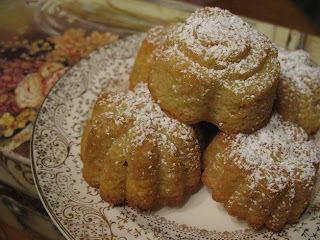 Hopefully a Powdered Sugar Pound Cake will be to your liking! 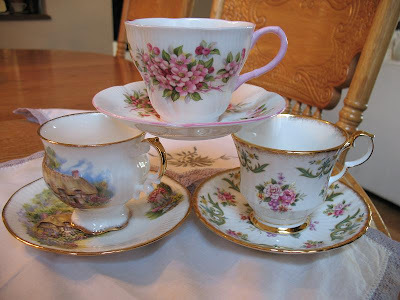 Today I'm sharing a teacup trio with you - I call them Inherited Elegance. I inherited these teacups from my Grandmother. When my Grandpa passed away a few years ago (my Grandmother passed away many years before), my Grandmother's things began to be distributed. My Grandmother had a lovely teacup collection - most had been gifts. The Moms & Aunts decided that it would be nice for each granddaughter to get three teacups. What a precious gift! I have cherished my three! These teacups were kept in a cabinet with a glass door, right near the dining room table in my grandparents' house. I admired them many a time as a child and my sister and cousins would all pick out our favorites. I even saw them in use several times as my Grandmother did often make and serve tea. Even though I consider these cups heirlooms, I use them regularly. They are often the very first teacups I pull out when serving tea to guests! These cups bring back memories of my grandparents' house ~ the hustle & bustle in the kitchen, the yummy smells wafting through the house, the sound of Grandpa playing The Entertainer on the piano, the laughter of cousins upstairs making up skits to perform, the crackle of the fire in the fireplace ~ aaaahhhhh. I hope that you will share a Teacup Tale today! You could share a favorite teacup, a memory of a teacup, teacups you wish you had, teacup pictures - be creative! Prepare your Teacup Tale post (if you haven't already) and come back here to link it up with MckLinky below. If you don't have a blog, please feel free to share about your teacups in the comments! Have a lovely Tea For Two-sday and keep checking back to enjoy some other Teacup Tales today! Oh I loved your teacup tale my friend. And those tea cups are beautiful!!! What wonderful memories of you and your Grandparents!!! Big the tea cup on the top was making me a little nervous for fear of it falling and smashing into little pieces size hugs to you! and that powdered sugar pound cake...yum. Must go look at that recipe! Oh what a sweet story! And they are beautiful tea cups. I have my husband's grandmother's tea cups. They have special meaning to us as well. I really wanted to participate today. But was not able to. I did give a shout out to you, though. I think I am going to add it into my Thursday post. Those are very pretty teacups. What a wonderful tea cup story! I hope to someday have a few of my grandmother's as well... they were all wedding gifts (*the* gift apparently, back in the day). Lisa, that's such a precious Teacup story. I love the memories that go along with your Teacups, and I really love that you use them and don't just let them sit there. I have always had a thing for tea cups! Don't know why or where my love for them began. I look forward to participating in the future. Your grandparents cups are lovely. What wonderful memories! Your grandmother's tea cups are beautiful. I love vintage cups. Thank you for sharing the pics! They are so beautiful...and what a wonderful story behind them! !